Name: Galeocerdo - is from the Greek words "Galeos" and "Kerdo" which mean "Shark" and "Fox", or the "Fox Shark"
The Common name is the "Tiger Shark"
The species name Cuvier is named after the naturalist who described the shark. Taxonomy: Tiger sharks are in the Carcharhiniformes order, and belong to the Carcharhinidae family. Order: Carcharhiniformes Family: Carcharhinidae (Requiem Sharks) Genus: Galeocerdo Species: Cuvier. 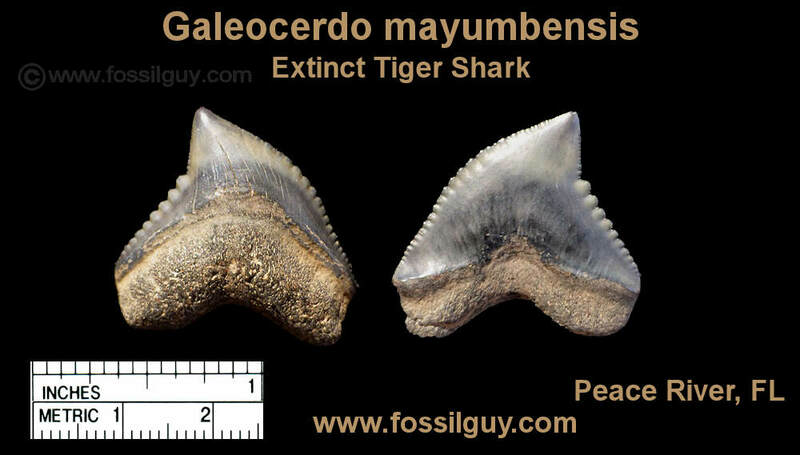 Tiger sharks first appear in the fossil record in the Eocene as Galeocerdo latidens. Today there is one living species of tiger shark, Galeocerdo cuvier. 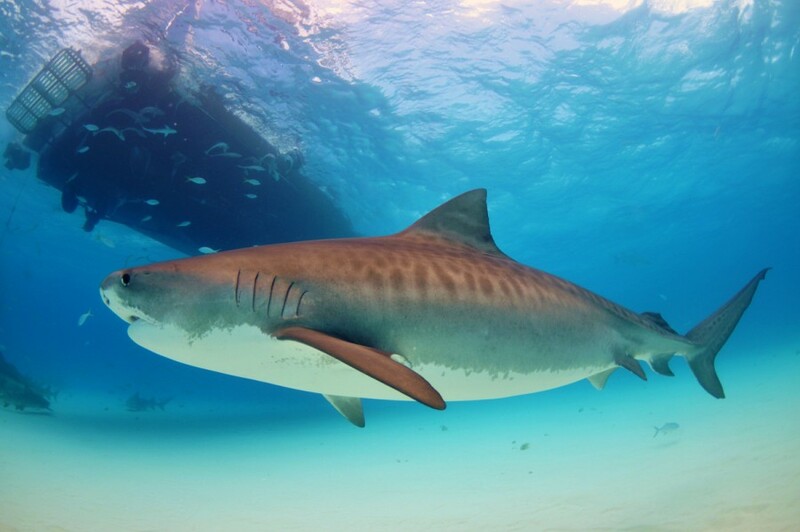 Tiger sharks are found in tropical and temperate waters across the globe, including the Pacific. The only place they do no occur in temerate waters is in the Mediterranean Sea. Tiger sharks are large sharks with an unmistakable appearance as they have very short and blunt snouts. They also have a unique color pattern. At birth, Tiger sharks have dark spots along their dorsal surface, which fuse into vertical bars or stripes at maturity. These unique stripes begin to fade as the shark ages. Tiger sharks are large sharks. Their average lengths are around 11 - 14 feet. Large specimens can reach up to 18 feet in length. 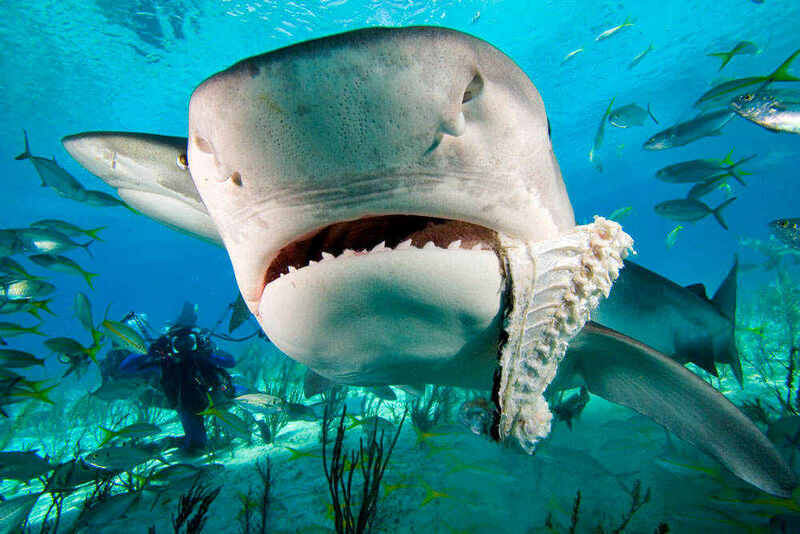 Tiger sharks have unique looking teeth, they are short, wide, and robust looking. The blades are covered with serrations. Tiger sharks have been known to eat just about anything, Bony fish, other sharks, dolphins, sea turtles, to squid, and crustaceans. The IUCN has the Tiger shark listed as lower risk or near threatened. Tiger sharks have been found with very weird things in their stomachs, including car license plates, tires, and even a chicken coop complete with chickens! The Tiger shark, Galeocerdo genus, made its first appearance in the Eocene as G. latidens. G. latidens was a smaller Tiger shark with a proportionately wider root than other Tiger species. 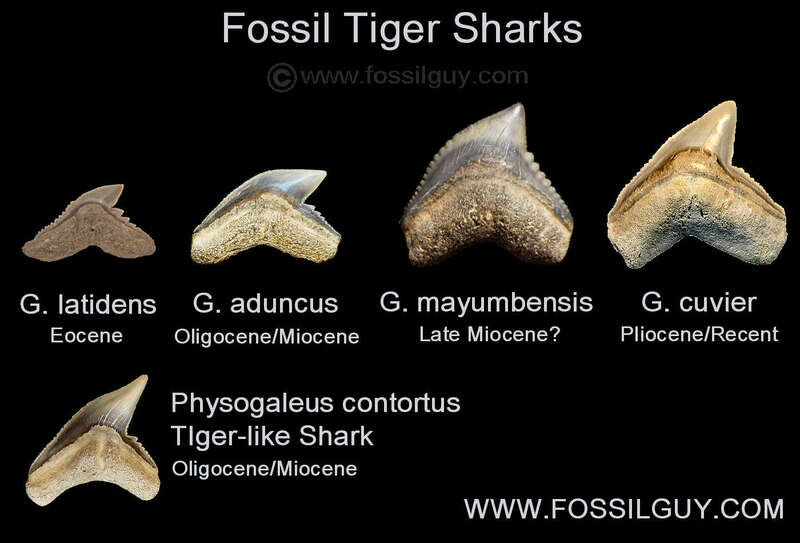 By the Oligocene, G. aduncus became the main tiger shark. This species became extinct in the late Miocene. It is replaced by G. cuvier in the Pliocene. G. cuvier is now the only extant Tiger species. G. cuvier, Modern Tiger sharks, are among the largest sharks; lengths of 3.35 m - 4.25 m (11 - 14 ft) are common, while the largest specimens are believed to exceed 5.5 m (18 ft) (Castro, p.125). Because Tiger sharks have a unique Tiger stripe pattern, they are easy to identify and often referred to as the spotted shark or leopard shark. As pups, they have dark spots along their dorsal surface, which fuse into vertical bars or stripes at maturity. These unique stripes begin to fade as the shark ages (Castro, p.125). Tiger sharks also have very short, blunt snouts. These characteristics make it very difficult to misidentify a Tiger shark. Tiger sharks are found in all subtropical and warm temperate seas (Compagno, p.283). They prefer coastal areas, and are commonly found in river estuaries and harbors. In North America, they are found from Massachusetts down to the Gulf of Mexico and the Caribbean. On the Pacific side, they are found in Hawaii, and southward from Southern California. They are also known to seasonally migrate, moving from temperate to tropical waters in the winter; they also make long migrations between islands in the Pacific. Tiger sharks are not found in the Mediterranean Sea. Tiger sharks are solitary nocturnal hunters and feeders. They will eat just about anything! Their diets include bony fishes, sharks, rays, dolphins, turtles, crabs, squid, birds, and even garbage (Castro, p.126). Tiger sharks are also known to prey on humans. They are second only to the Great White Shark in number of reported attacks on humans. However, please remember, a shark attack is a very rare event; normally these creatures will stay away from humans. This shark has very little commercial value other than its jaws in souvenir shops. Some countries, however, use the shark for its fins. It is also classified as a game fish and loved by sports fisherman. The International Union for Conservation of Nature and Natural Resources (IUCN) has the Tiger shark listed as lower risk / near threatened. For ancient native Hawaiians, sharks played a very spiritual role. They were considered "na aumakua" or ancestor spirits. The larger sharks, the Tiger sharks and Great Whites were called "niuhi." Eating the eyes of niuhi gave chiefs special intuition. Women were not allowed to eat niuhi. Besides for being spiritual beings, shark skin and teeth had many uses. Specifically, Tiger shark teeth were often crafted onto wood and used as knives and other cutting instruments. They were even attached to war clubs, and other weapons. These artifacts can be seen in the Bishop Museum in Oahu. This image shows a replica shark weapon. Real polynesian shark tooth weapons can be seen in the Bishop Museum in Honolulu, Hawaii and also in the War Memorial Museum in Aukland, New Zealand. 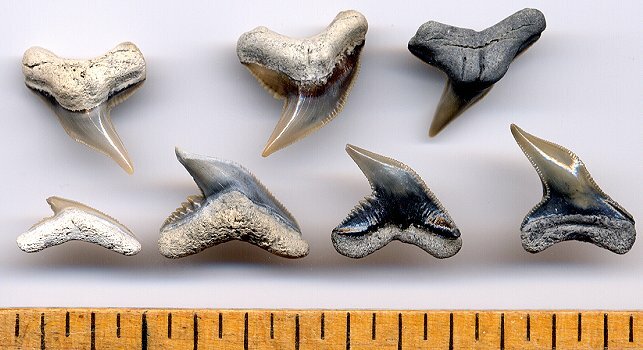 This image shows most of the fossil Tiger shark teeth that can be found. There is tremendous variation among individual species. The best way to I.D. them is to know what time period you are fossil collecting in. Tiger sharks make their appearance in the Eocene. There appears to be two Eocene species, the more common G. latidens, and the less common G. eaglesomei. 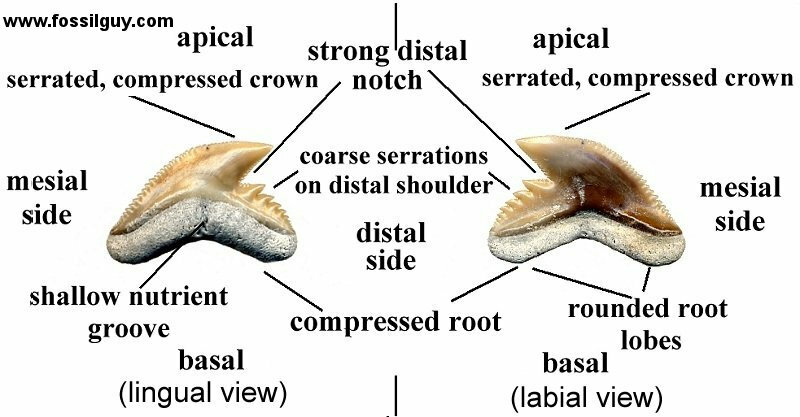 Both of these teeth look like smaller versions of the modern Tiger shark with simple serrations, while G. eaglesomei tends to have a taller crown. In the Oligocene and Miocene, G. aduncus appears. These teeth, again, look like smaller and less robust versions of the modern Tiger shark. They also have simple serrations. Another Tiger shark, G. mayumbensis, is possibly a late Miocene species. 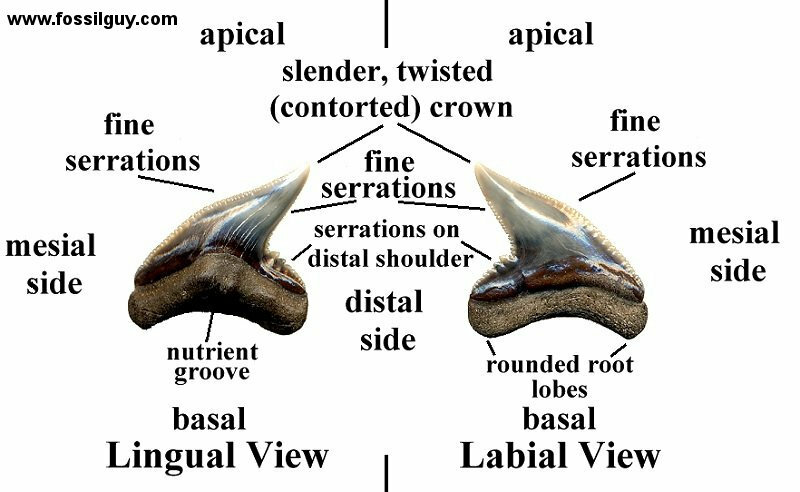 This shark had teeth similar in size and the complex serrations (serrations on serrations) of the modern Tiger shark, G. cuvier. It differs by having a noticably taller crown. G. mayumbensis appears to be short lived and restricted to Florida in North America. More research is needed on this odd species. In the early Pliocene, G. cuvier, the modern tiger shark appears. This shark has large teeth with complex serrations. Finally, there is also a Tiger-like shark in Oligocene and Miocene deposits. It was once thought to be a tiger shark, but has been reclassified to a differnet genus. It's called Physogaleus contortus. P. contortus are very common in the Miocene. They have a slender, twisted crown that is ideal for grasping fish. G. cuvier is the extant (living) Tiger shark. These teeth are unmistakable. G. cuvier teeth are the largest of all species of Tiger shark, and are very robust looking. They have an average length of approximately 2.9 cm (1.1") and an average height of approximately 2.2 cm (.86") (Purdy et al, p.149). Tiger teeth have complex serrations on their mesial cutting edges, and serrated distal cutting edges that are strongly notched. These teeth are ideal for a cutting dentition. The roots of Tiger teeth are flattened with square-like root lobes (Cocke, p.60). While sharks of the carcharhinid family generally have upper teeth that are designed to cut and lower teeth that are designed to grasp, Tiger sharks have rows of almost identical teeth in both their upper and lower jaws. This creates a nightmare for the average fossil collector trying to identify upper teeth from lower teeth. Purdy et al identifies very slight differences in Tiger shark upper and lower teeth. In lower teeth, the tips of the crowns usually have a slight lingual bend, lower teeth have a slightly developed Taurus on the root, and the arch formed by the lower root is often asymmetrical (Purdy et al p.149). For upper teeth, they can have a noticeable labial curvature, and the arch formed by the lower root is usually more symmetrical (Purdy et al p.149). You may have noticed the use of words such as "usually," "can," and "often," this means not all teeth exhibit these characteristics. If you try and separate your uppers from lowers, good luck! I have been unsuccessful at separating most of my Tiger shark teeth. G. cuvier can be found at Aurora, NC, and along the Peace River of Florida. Below is a diagram of a G. cuvier tooth showing the terminoligy and an image of different tooth positions. Although tooth positions of tiger teeth appear very similar, the above image shows just how different tooth positions actually are. The first left two are either symphysial or parasymphysial teeth, the middle two are laterals, and the right two teeth are posteriors. G. aduncus is and extinct species that appeared in the Oligocene and became extinct in the late Miocene. This species of Tiger shark probably looked like a miniature, but less robust version of G. cuvier. The serrations on the teeth are simple, whereas the serrations on G. cuvier are complex (the serrations are serrated). Below is a diagram of a G. aduncus tooth. G. aduncus are very common along the Calvert Cliffs of MD. P. contortus is an extinct Tiger-like shark that, as with G. aduncus, appeared in the Oligocene and became extinct in the late Miocene. This shark had a very different tooth form. They are similar in size to G. aduncus, but have thicker roots. Their crowns are slender and twisted; ideal for a grasping dentition. 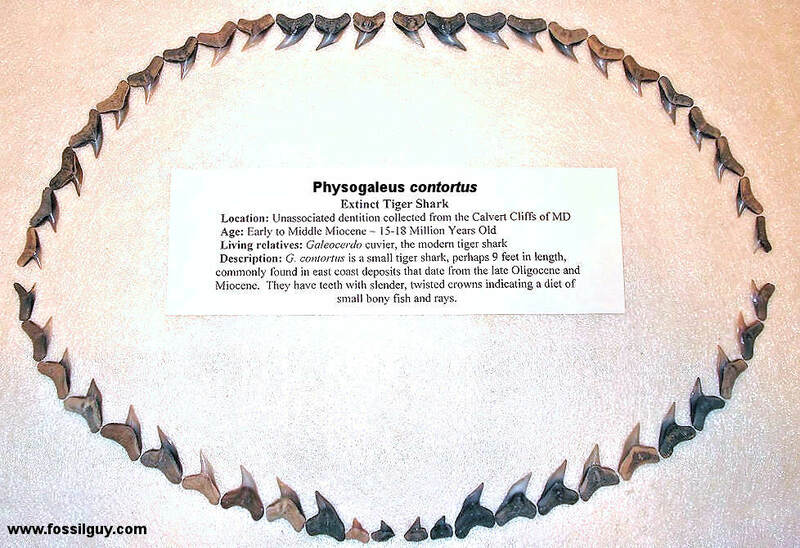 These sharks are very common in the Miocene, and are abundant at the Calvert Cliffs of MD. Below is a diagram of a P. contortus tooth. The following image is my composite dentition of P. contortus from countless teeth collected along the Calvert Cliffs of Maryland. It was reconstructed based on a picture of a composite dentition from the Lee Creek III book (Purdy et al, p.147). A few collected contortus teeth have the mesial cutting edges completely sheared off. This type of feeding damage is very easy to recognize. The following image shows three teeth with this specific damage. When studying the morphology of tiger teeth, a probable reason emerges. Since the interior angle between the root base and the mesial cutting edge is acute, any excessive stress, such as biting into bone, would channel enough force to easily sheer off the mesial cutting edge. This type of feeding damage can also be seen in Hemipristis teeth, which have a similar acute interior angle. P. contortus teeth that have their mesial cutting edges sheered off. The left two are from the Calvert Cliffs of MD, and the right one is from Aurora, NC. If you are into sharks and don't have a book by Compagno, you are missing out! He is the one that cataloged the sharks for the FAO species catalogue. He is very thourough and not overly technical, which is a rarity! This book has full over 400 accurate and full color illustrations of all the known shark species plus a bunch on undescribed ones. The illustrations are done by Mark Dando, which is probably the best shark artist out there. It also goes over shark biology, life history, and shark/human interactions. It's should be the main reference for anyone interested in sharks. There is now an update to this book: Sharks of the World: A Fully Illustrated Guide , 2013. It's a hard cover, updated, and beefed up version of the 2005 book. It's a little pricier, but worth it! A great book for identifying all those fossil shark teeth. This book is laid out "as simple as possible." It's ease of use and small size makes it great to carry during collecting trips. This book shows teeth from around the globe, but all the Calvert teeth can be found in it. 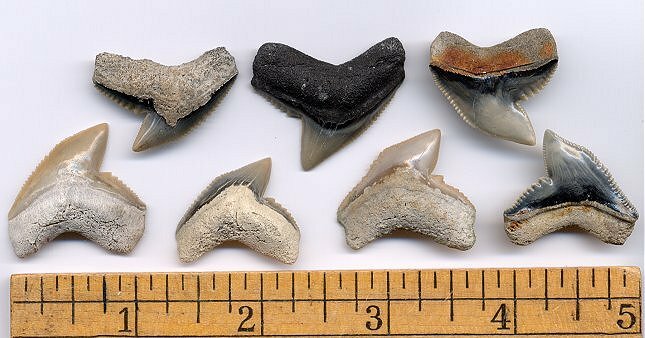 Teeth from various species of fossil Tiger shark are found in almost any marine Oligocene to Recent deposits. These include deposits along the entire east coast of the United States. Places to find them include the Chesapeake Bay Area (Calvert Cliffs Site), North Carolina (Aurora Site), and Florida (Venice Beach or the Peace River.). The rightmost two are labial views. All others are lingual views. 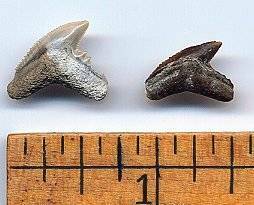 These are from the Yorktown formation in North Carolina. The rightmost two are labial views. All others are lingual views. These are from the Pungo River formation in North Carolina. These are sample G. aduncus teeth from the Calvert Cliffs of MD. This is a less common tooth from the Peace River of Florida. These are sample P. contortus teeth from the Pungo River formation of North Carolina. 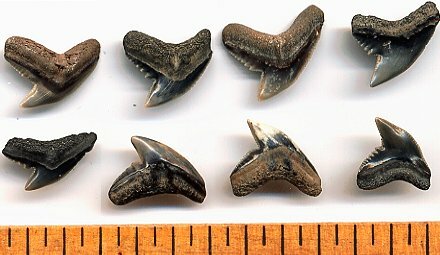 These are sample P. contortus teeth from the Miocene Calvert formation of the Calvert Cliffs of MD. Castro, Jose L. (1996). Sharks of North American Waters. College Station: Texas AandM University Press. Hamlett, William C, ed. (1999). Sharks, skates, and rays : the biology of elasmobranch fishes. Baltimore : Johns Hopkins University Press. Michael, Scott W. (1993). Reef sharks and rays of the world : a guide to their identification, behavior, and ecology. Monterey, CA. : Sea Challengers. Purdy, R., Schneider, V., Appelgate, S., McLellan, J., Meyer, R. & Slaughter, R. (2001). The Neogene Sharks, Rays, and Bony Fishes from Lee Creek Mine, Aurora, North Carolina. In: Geology and Paleontology of the Lee Creek Mine, North Carolina, III. C. E. Ray & D. J. Bohaska eds. Smithsonian Contributions to Paleobiology, No 90. Smithsonian Institution Press, Washington D.C. pp. 71-202. Ward, D.J. & Bonavia, C.G. (2001). Additions to, and a review of, the Miocene shark and ray fauna of Malta. Central Mediterranean Naturalist, 3 (3): 131-146.